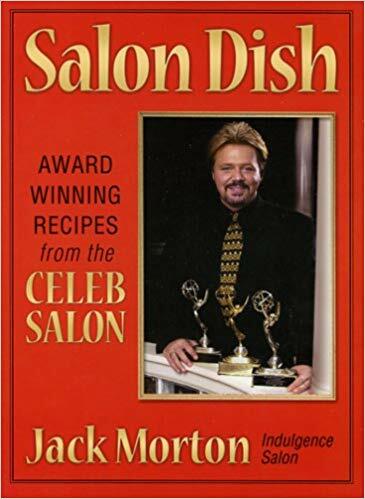 Award-winning celebrity stylist Jack Morton, owner of Indulgence Salon, serves up a festive book of taste-tempting recipes, gathered from a star-studded cast of Buckhead clientele, celebrities and media personalities in his new book, Salon Dish. Including recipes served at the Governors mansion for state dinners, family recipes handed down through the generations, and everyday personal favorites, Salon Dish celebrates the best recipes ever eaten by Mortons good-looking and good-cooking clients. Frequently called The Celeb Salon, Indulgence Salon services a clientele list packed with well known celebrities including Jane Fonda, President Jimmy Carter, Senator John McCain, Peter Jennings, Charlton Heston, Sally Fields, Miss Georgia, Joan Lunden, Jack Ford and scores of other famous local and national personalities. Jack Morton, a well-known media personality, has gained local and national praise for his Indulgence Salon, one of the nations leading salons. With more than 20 years of hair styling and make-up experience, Morton has brought Indulgence to the industry forefront. A four-time Emmy award-winning stylist for hair, make-up and wardrobe, skilled cook and seasoned how-to expert, Jack Morton has a huge following for his lifestyle advice on decorating and entertaining. Featured weekly on NBC-Affiliate WXIA TV with his "Jack Of All Trades" noon broadcast segment, Morton is also seen monthly with his popular enter-to-win "Changing Faces." Previously he appeared for 14 years with makeover appearances on Noonday, NBCs daytime talk show. Morton has done hair and make-up for the Emmy Awards, ABC (Official Stylist during 1996 Olympic Games), Disney, Paramount, Orion, HGTV, local NBC affiliates, as well as an extensive line-up of major theater productions. Morton has also appeared on other Atlanta affiliates including ABC, FOX, WTBS, CNN, HGTV and CBS.